Figure 1 provides an example that demonstrates how Internet Control Message Protocol (ICMP) destination port unreachable messages are generated. In the example, host h1 sends a UDP packet to port 30000 on host h4. The packet message transits switches s1 and s2 on its path to h4. In this case, h4 is not running a service that listens for UDP packets on port 30000, so host h4 sends an ICMP destination port unreachable message (ICMP type 3, code 3) back to host h1 to inform it that that the port cannot be reached. ICMP unreachable messages include the header of the original packet within their payload so that the sender can examine the header fields and determine the source of the error. The sources of scanning activity can identify compromised hosts on the network and gives information about potential security challenges to the network. From the example, UDP port 30000 is known to be associated with trojan activity and so any requests to connect to this port from host h1 suggest that h1 may be compromised. It also make sense to follow up to see if any hosts are responding to requests to UDP port 30000. The challenge in monitoring ICMP messages is that there is no single location that can see all the messages - they take a direct path between sender and receiver. Installing monitoring agents on all the hosts poses practical challenges in a heterogeneous environment, and agent based monitoring may be circumvented since trojans often disable security monitoring software when they infect a host. 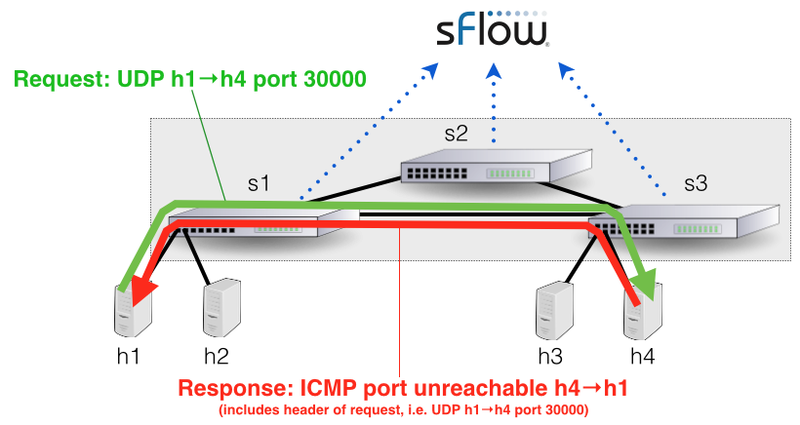 Support for the sFlow standard in switches provides an independent method of profiling host behavior. The sFlow standard is widely supported by switch vendors and has the scaleability to deliver real-time, network wide, monitoring of host traffic. The switches export packet headers, allowing the central monitoring software to perform deep packet inspection and extract details from the ICMP protocol. 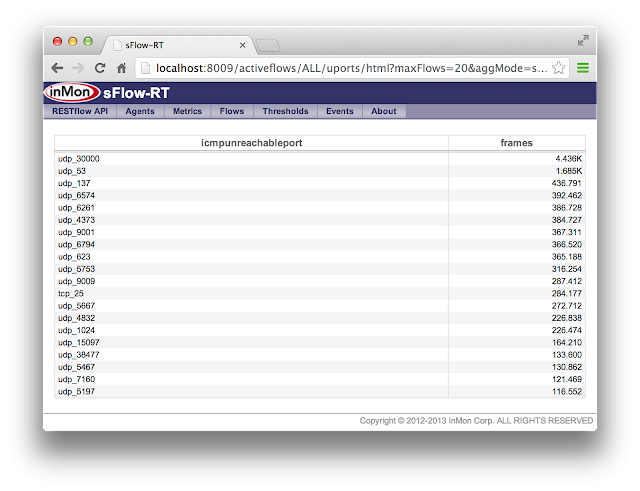 DNS amplification attacks describes how the sFlow-RT analyzer can be used to monitor DNS activity. The SMURF attack uses spoofed ICMP messages as a method of DDoS amplification and similar techniques to those described in the DNS article can be used to detect and mitigate these attacks. 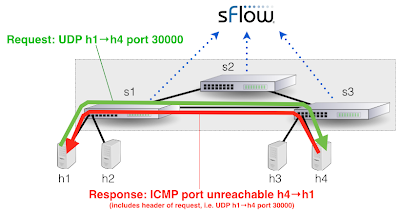 The following example illustrates how sFlow can be used to monitor ICMP unreachable activity; a single instance of sFlow-RT is monitoring 7500 switch ports in a data center network. Using the script API has a number of advantages: it ensures that flow definitions are automatically reinstated on a system restart, makes it easy to generate trend charts (for example the graphite() function sends metrics to Graphite for integration in performance dashboards) and to automate the response when ICMP anomalies are detected (for example, using the syslog() function to send an alert or http() to access a REST API on a device or SDN controller to block the traffic). The table above (http://localhost:8008/activeflows/ALL/uports/html?maxFlows=20&aggMode=sum) shows a continuously updating, real-time, view of the top ICMP unreachable ports - a bit like the Linux top command, but applied to the active flows. The table shows that the most frequently reported unreachable port is UDP port 30000. Note: Examples of these detailed flows have been omitted to preserve the anonymity. While this example focused on a data center hosting servers, a similar approach could be used to monitor campus networks, detecting hosts that are scanning or participating in DDoS attacks. 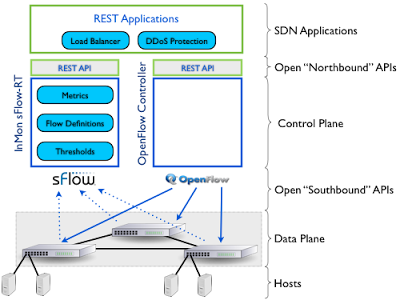 In this case, the SDN controller would respond by isolating the compromised hosts from the rest of the network.